Saltwater fish tanks, also referred to as saltwater aquariums, are a great addition to any home and family. They offer a peaceful and serene centerpiece to any room. What makes saltwater tanks so beautiful are a multitude of aspects. The saltwater aquarium itself is an elegant piece of furniture that you can then decorate to your style and liking. 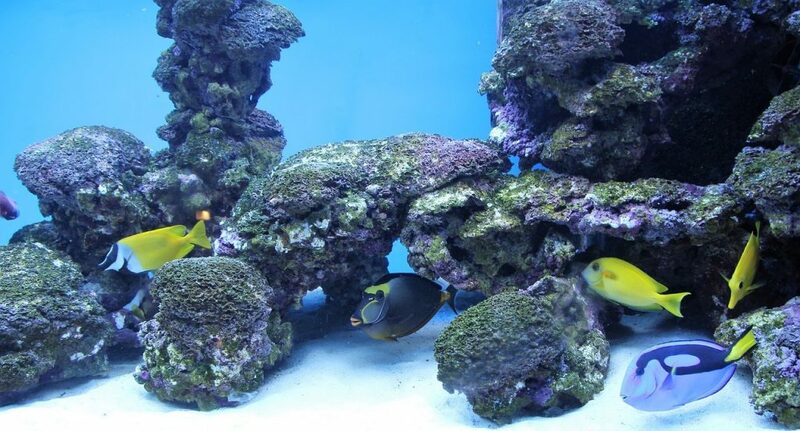 The options for decorating your aquarium are almost endless due to the many different varieties of sand, gravel, pebbles, stones, plants, decorations, and ornaments. Obviously what really makes a tank or aquarium stand out are the beautiful and vibrant fish. Saltwater fish, also known as marine fish, come in many different varieties. Some of those varieties include: Clownfish, Damselfish, Tangs, Mollies, Butterfly Fish, Firefish, Dottyback, Watchman Goby, and many more. While the varieties are numerous to say the least, they all require similar environments to live and thrive. 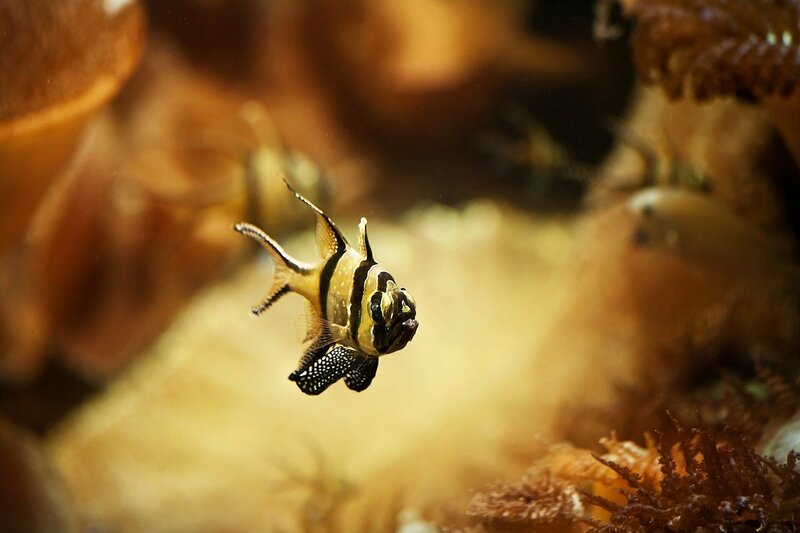 Half the battle is ensuring the environment is setup correctly so that your saltwater fish live happy, healthy and stress free lives are water conditioning to the exact specifications that the fish require as well as the right temperature and salt level. The other half of the battle and very important factor in keeping your fish alive and healthy, is their food and daily diet. While all of your saltwater fish will generally eat the same food, each option in this list of the best saltwater fish food has their advantages and disadvantages. 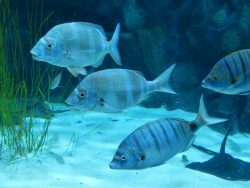 Having a community of marine fish means that your fish will live and eat at different levels within the fish tank. Depending what saltwater fish you get, they could be top feeders, middle feeders, or bottom feeders. 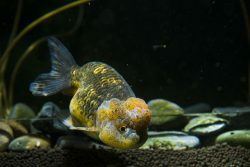 Sometimes one fish food on this list is good enough for your entire aquarium, but other times you might need a combination of foods. Wether that’s because different foods sink at different rates or you just have picky eaters, using a combination is a great idea. The list below will provide you with information and pros and cons about what we believe to be the 5 best saltwater fish food options. Each review has some general and nutritional information as well as if there are any issues with that particular fish food option. We hope that this list marine food options helps you to choose the option or combination that will work best for your situation and fish needs. The list will cover almost all of your saltwater fish community and make them very happy, healthy and beautiful. With the right food and the other healthy environmental factors met, your fish will live long and stress free lives. New Life Spectrum Marine Fish Formula Sinking Pellet Fish Food is our number one food option for your saltwater fish. It’s a daily food diet for all types of fish in your community aquarium including carnivores, herbivores, and omnivores. These sinking pellets are high in nutrition which helps with digestion, ultimately keeping the water cleaner and your marine fish happy and healthy. Another benefit of this fish food is the natural color enhancing properties. You will see the beautiful and natural colors truly show in your little friends. New Life Spectrum Marine Fish Formula Sinking Pellet Fish Food contains no soybean products and contains all natural ingredients helping to boost your fish’s immune systems. The good news is they sink which help to feed all of your fish at each of the fish tank levels including top feeders, middle feeders, and bottom feeders. The bad news is they can sink too quickly so sometimes your top feeders might need some extra food added which can ultimately create more waste in your aquarium. We recommend on feeding small amounts at a time so that all of your fish have a chance to eat and you create less waste and cleaning. Zoo Med Spirulina 20 Flake Fish Food is actually great for both freshwater and saltwater fish, but we prefer to use it as saltwater fish food. You can see the products we recommend for freshwater fish in our best tropical fish food list. These flakes are a daily diet that offer color enhancing ingredients along with raw protein, minerals, and 7 different vitamins. Spirulina, which is obviously in the name, is a key ingredient in this fish food. Spirulina is a cyanobacterium that contains complete proteins and essential amino acids. 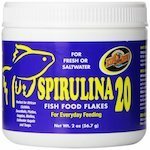 So in essence, Spirulina provides your fish friends with protein, vitamins, minerals, and amino acids, which all help the health, well-being and immune system of your freshwater marine fish. Zoo Med Spirulina 20 Flake Fish Food will help to enhance to color of your aquarium fish and help keep them happy, healthy, and stress free. They are flakes which will both float and sink and feed all your various fish. However, one major issue is any uneaten flakes could cause excess algae to grow, a bi-product of using Spirulina. Following feeding directions will help alleviate this issue along with good tank maintenance. TetraMarine Marine Flakes offers a nutritionally balanced daily diet along with vitamin C and to enhance and extend the life of your saltwater fish. Tetra uses a ProCare blend for all of their fish food that includes ingredients specifically chosen to provide the right amount of nutrients, minerals, and vitamins for your marine fish. These flakes will also help increase vitality and enhance the beautiful and natural color of your aquarium fish. TetraMarine Marine Flakes are easy for your fish to digest which help ensure that your fish tank water does not get cloudy making less cleanup work for you in the long run, who doesn’t want that. One minor issue is that the flakes are quite large so if you have small and young fish we do recommend breaking up a portion of the flakes into smaller more manageable pieces. Either way, your fish are going to love these flakes. Ocean Nutrition Brine Shrimp Plus Flake are a complete and nutritious option for your saltwater fish community. Included in this blend salmon, plankton, clams, krill, squid, herring, and of course bring shrimp. This food will provide your little fish friends with vitamins and minerals. It also includes ingredients that help enhance the natural color of your marine fish, as well as boost immune system and promoting long lives. 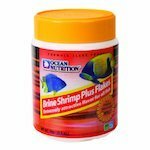 Ocean Nutrition Brine Shrimp Plus Flake are highly digestible and include low ash and phosphates which all help to maintain a clean and stress free fish tank by not clouding the water. This is a good alternative to pellets and can also be used for topical and freshwater fish if you keep both freshwater aquariums and saltwater aquariums. The flakes in this blend are smaller which you bigger fish might not enjoy as much if they are picky eaters. 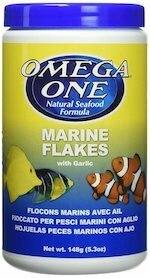 Omega One Marine Flakes with Garlic comes in last on our list but that doesn’t make it any less of a quality fish food product. However, the difference with this food is that is has an extra dose of garlic. Why garlic you ask? Fish love the smell of garlic and it helps to improve their appetite. These flakes are good for both a regular daily diet or can be used for particularly stubborn marine saltwater fish that refuse to each the other food you have tried. Garlic also helps to control internal and external parasites. Omega One Marine Flakes with Garlic helps to boost and strengthen your fish’s immune system. The flakes also include Omega 3 & 6 and salmon skin pigments for natural color enhancement. These flakes don’t hold together as well as some of the other options and can come broken up into smaller pieces, which bigger fish tend to not particularly like eating. We hope that this guide provides you all the details and information you need to make an informed decision about which saltwater food option to go with. They are all great options and you won’t go wrong with whichever brand you choose. Please leave feedback below with which food you prefer to feed your saltwater community, or if we missed any important details.